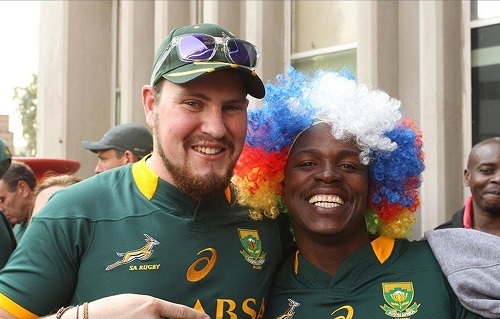 I was fortunate enough to be a guest of Asics at Ellis Park last weekend to witness the Springboks play their nemesis the All Blacks. This was the first time I have ever watched the ultimate world rugby fixture and I was not short changed. I have had some outstanding live sports experiences. I have watched Chris Gayle score 180 before tea in a four day game, I have seen Per Metersacker score the winner for Arsenal at Craven Cottage, I have seen Venus Williams beat her sister. But watching the Springboks take on the All Blacks, at Ellis Park specifically, is probably the ultimate fixture you can watch in South African sport. From the moment we got on the Gautrain amongst all the other Springbok clad supporters wearing the various Asics sponsored shirts to seeing the Blitzbokke squad sit just a row behind me and of course seeing the Boks take to the field for the warm ups, you just knew that the day was going to be a special day. Being able to watch the Haka live is something that I will never forget, but quite honestly the singing of our national anthem in Ellis Park is the thing that really produced the goosebumps. Black, White, Coloured and Indian arm-in-arm with only one goal. Beating the World Champions. The magic was still coming though as South Africa produced arguably the try of the season finished off by Francois Hougaard and Handre Pollard underlined himself as the flyhalf around which the Springboks should build. In true All Black fashion they fought back and took the lead and a sensational match was won by a remarkable kick by Patrick Lambie. 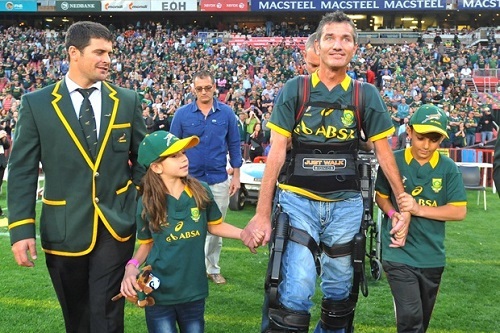 The magic was also apparent in the most goosebump-inducing manner of the day at half time when Springbok legend Joost van der Westhuizen, suffering with ALS, walked onto the field. It brought back memories of Joost playing a massive part in uniting the nation in 1995. It brought back memories of Joost devastating defenses in his 89 caps. And of course it brought back tears to every eye in the stadium. It was a game that was made of rugby, it was a game that was made of heart and it was a game that was made of pride. I am so thankful that I got to watch alongside my wife and brother and got to experience a brilliant Springbok victory. For anyone that has a sporting list bucket list, I have to advise this as the rugby fixture you have to see.